Margareta here to take you on a little tour around my scrap space. I wish I could show you one of those gorgeous scrap rooms with oceans of space and several works stations with white furniture. My scrap corner does not look anything like that. I share our home office with my husband and here is my half of the room. 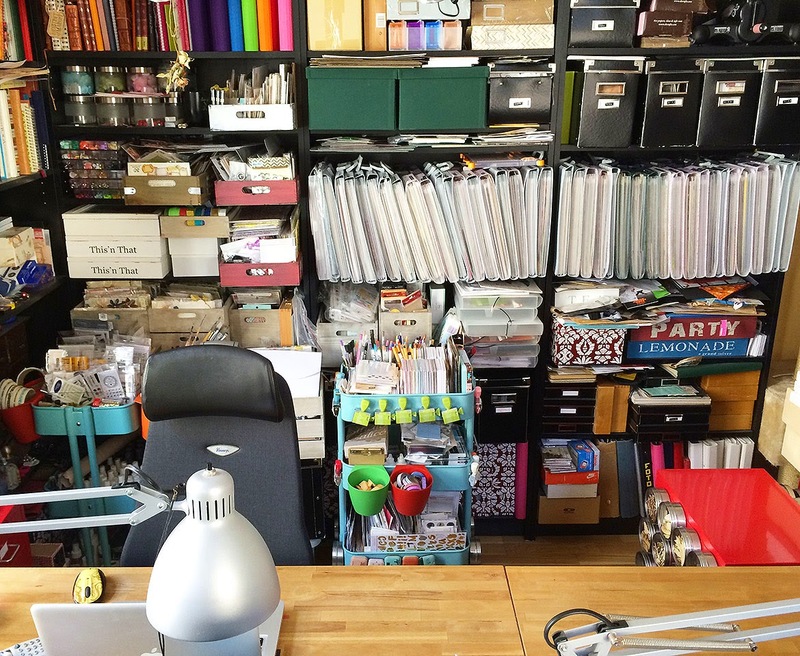 It is a super compact storage of my huge scrapbooking inventory (plus my work office, as I work from home) and may give a bit of a messy impression at first sight, just because there are so many things in here, but almost everything is very well organized. A good deal of my scrap stash storage units are set on wheels and almost everything comes from Ikea. In addition to several Billy book case units and a big Expedit, I also have 2 Raskog carts, 3 red Helmer drawer units and 2 Alex drawer units, all these are on wheels and more or less mobile. The Alex units are actually put below my big desk, behind two of the Helmer units, so you have to do a little 'puzzle play on wheels' to get to the drawers in the Alex units (see below). I only store items that I do not need too often in there, such as fun foam sheets, fresh sketch pads and page protectors. Below is my main Raskog cart. It contains everything I need for Project Life, cardmaking and my planner. Like the rest of my space, the cart is set up for super compact storage. 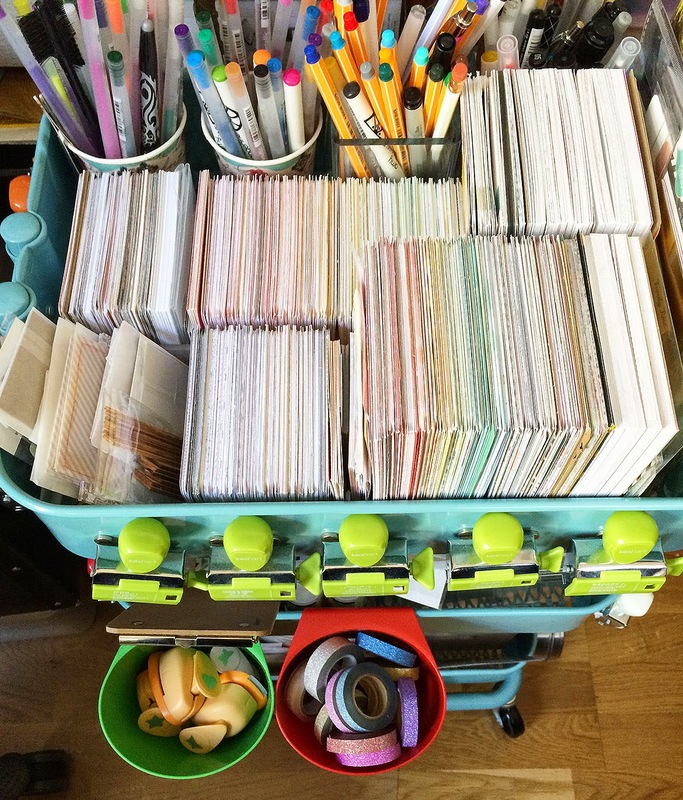 I utilize the sides of the trays to store my roller stamps (with the help of magnets) and Bygel containers from Ikea that can hang from the sides and keep all sorts of things, from small punches to washi tape. Even if my scrap space is tiny and compact, I have a nice long desk to work on. I have plenty of space for my Macbook, plus enough space left to open and spread my PL album at the same time. 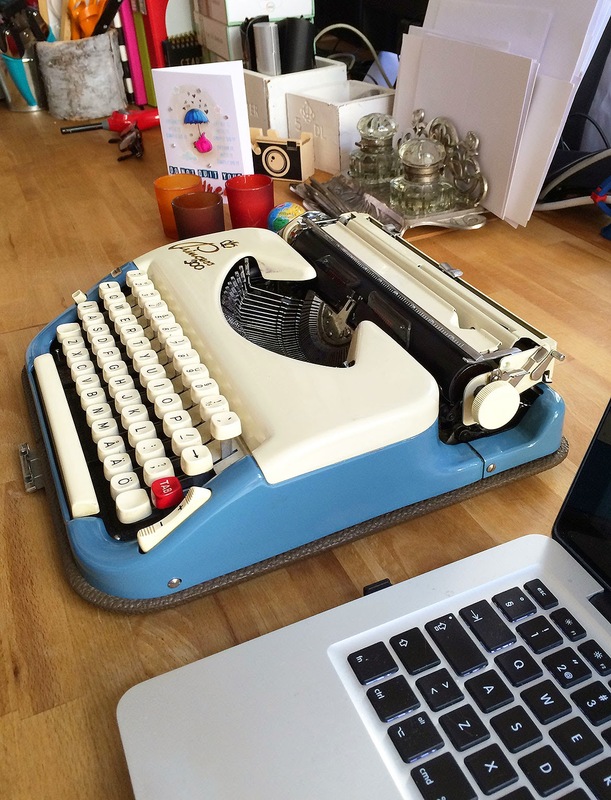 Here's my desk space with one of my beloved typewriters and an antique art nouveau desk set where I keep some card bases and stamp paper. Can you spot one of my Pinkfresh Studio cards on the desk (from the February kit)? At the short end of the desk, I keep my tools, my PL albums together with my planners, a stack of old PL kit boxes containing die cuts sorted by color, and my Canon Selphy photo printer. 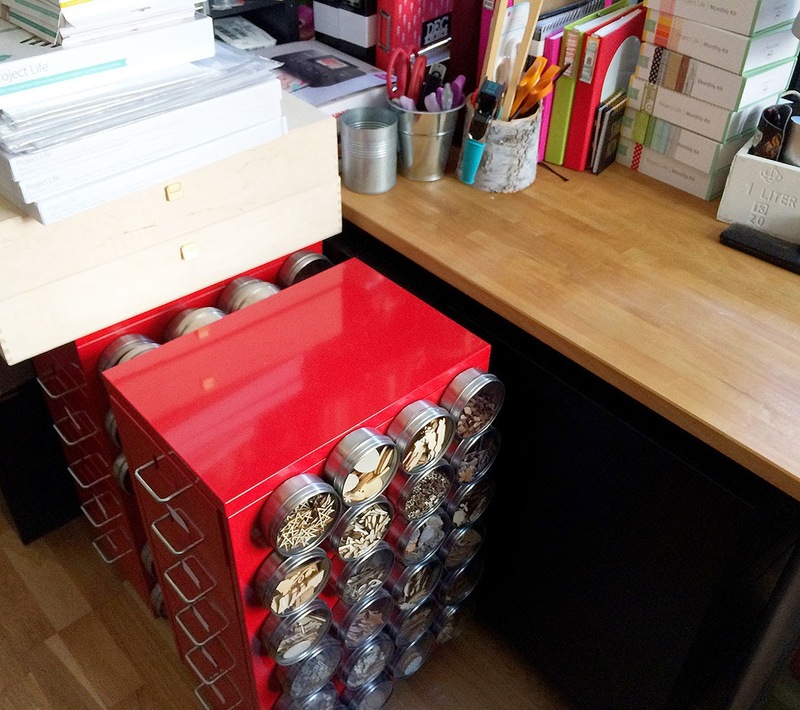 So you can see how much I can load onto my desk and still have good space left to scrapbook and make cards.